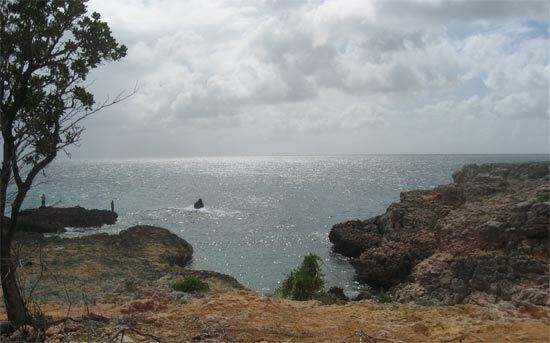 Hiking is one of the best things to do on cheap Caribbean vacations in Anguilla. The cost is $0 (except for a couple bottles of water and a few snacks), and they are always rewarding. 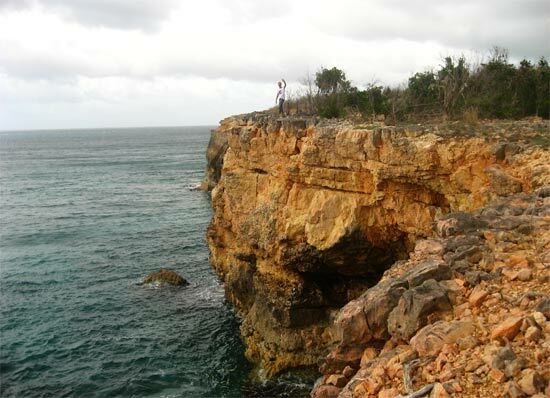 My Dad almost died on this particular Anguilla hike, the hike to Anguillita island. 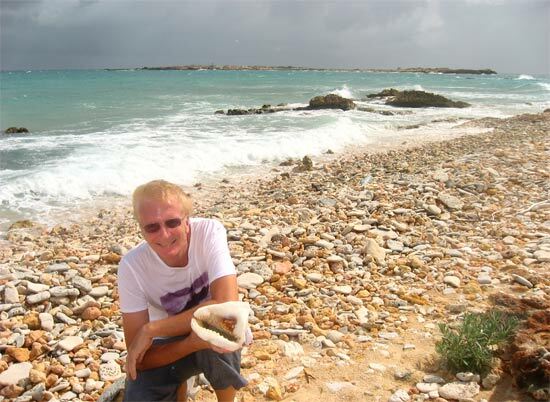 Anguillita is a tiny rock just off of Anguilla's most western tip. B) From the north... Along 30 foot rocky, and at times, crumbly cliffs. 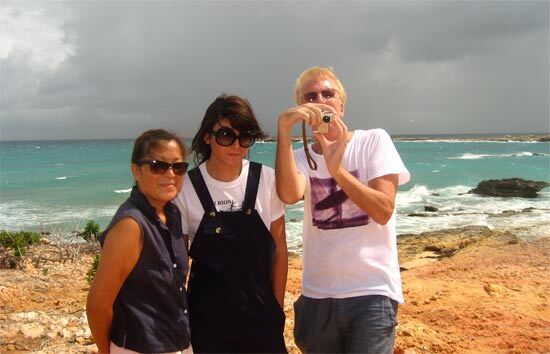 After our cheap Caribbean vacation that featured the cliffside approach to Anguillita, our family had not returned. Until... We discovered a new, easy way to the special spot! We drove down to the West End of Anguilla towards Trattoria. 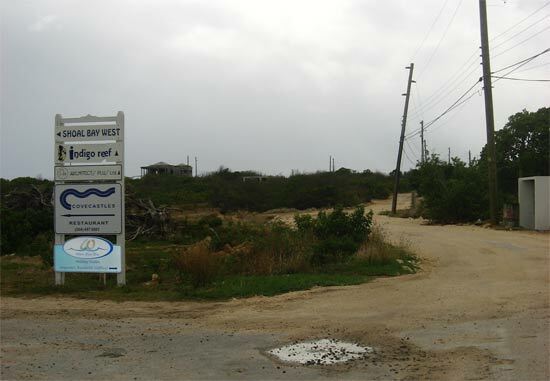 Instead of taking the road all the way to Shoal Bay West, we split off at the signs in the photo above. Shortly, we came to the very familiar "road block". 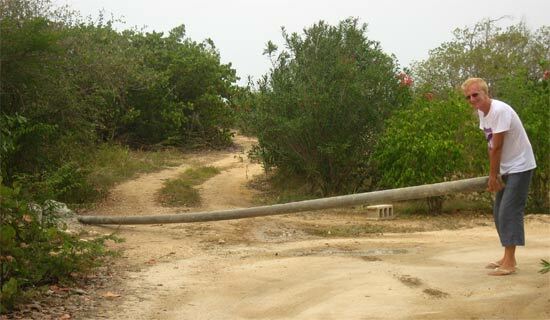 You know you are on the right path when you see a giant metal pole blocking the road ahead. Just follow my Dad's lead! Down the road we went, taking the first left. Wrong turn! Skip the first turn off. Keep going until the second one..
Back in the day, back on our first cheap Caribbean vacation hike, we would have continued straight along the road until we could go no further. From there? We would walk! But today, there are roads. From where the road ended, my Dad and I ventured left. Beyond the spit of sand is rocky ocean front. From that standing point, I understood how my Dad almost died. It remains uneven and rocky for a stretch, but to continue down the coast, you would have to climb up a small volcanic rock cliff. Then? Back down. Repeat. His only way of survival was not returning the way he came, but tearing through the bush where there are now roads. Silly Dad! 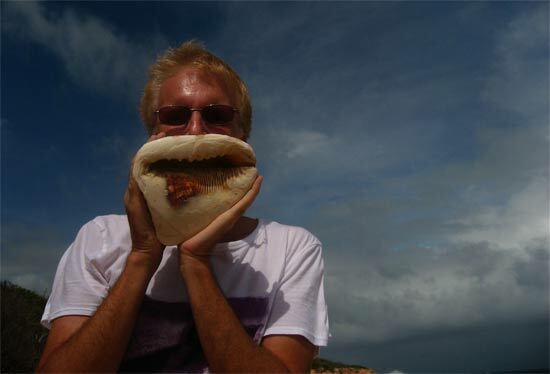 My Dad and His Big Mouth! The small channel between Anguillita and Anguilla is a rough one. From shore, we saw a fishing boat drive past, slamming down on the waves. With each hit the boat even flew out of the water! Yuki and I know what it feels like to be in that channel, too. The only thing you can do? Hold on! The fishing boat continued on into calmer waters, and we ventured right, around the tip's cliffside. We were there in time to catch a warm, afternoon sun and watch some men fishing off the sea rocks. The water was so clear and still. Basking in the sun, and becoming more dehydrated by the minute, the sea beckoned me to jump right in. It sure looked desirable. He he! The rocks were still crumbly and my Dad was still wearing flip flops! But, like Evil Knievel or Harry Houdini, my Dad made it back just fine, even beating me to the car. As we left, we noticed many paths off the main road to the cliffside. Many of those probbaly end up along the cliffs. That would be ideal for a little adventure, without the strain of starting way at the beginning of the trail. 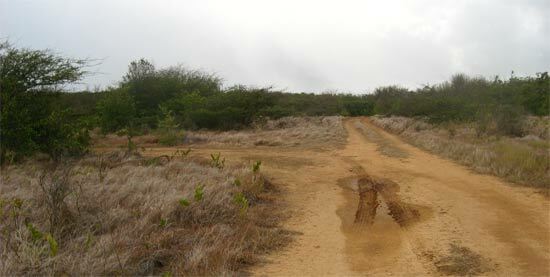 I don't know why they have cut new roads into Anguilla's West End, but it's paying off! The area is still secluded and quiet, and you can still go hiking on cheap Caribbean vacations. It doesn't have to be so deadly!